14K Strawberry Gold® Deep Sea Blue Topaz™ 3 cts. Ring with Chocolate Diamonds® 1/6 cts., Vanilla Diamonds® 1/8 cts. Legend has it that topaz dispels all enchantment and helps improve eyesight. In ancient times, it was believed that topaz had the power to increase strength and make the wearer invisible. Today, the gem is favored for its exquisite blue hue which can range from cool icy blues as featured in Le Vian®'s Ocean Blue TopazTM to the deep, Mediterranean blues in Deep Sea Blue TopazTM. An interesting characteristic of topaz is its ability to build up a distinct electrical charge from heat or friction that it will retain for several hours. 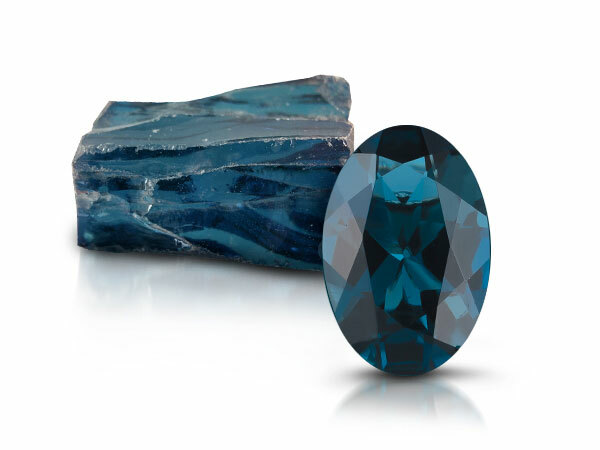 Blue is the most popular topaz color which is obtained through a diffusion treatment that is permanent. 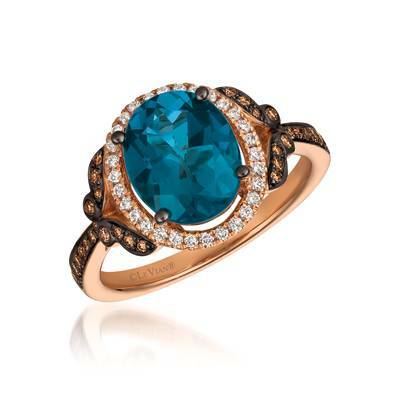 "Le Vian® offers two Blue Topaz flavors: Ocean Blue TopazTM which is a diffusion topaz that combines traditional topaz with the modern look of Santorini Blue; and Deep Sea Blue TopazTM, which features some of the deepest blue hues available"